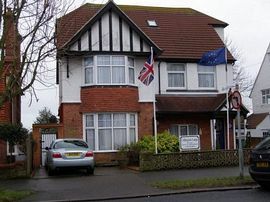 Collington Lodge is a beautiful Edwardian detached house situated in the lovely south coast town of Bexhill on Sea. It is within a 10 minute walk from the town centre, Bexhill railway station, beach and the famous De La Warr Pavilion. It is an ideal base for the visitor to explore the 1066 COUNTRY which boasts beautiful coastlines and countryside, castles, gardens, historical buildings, theatres and other attractions throughout the county. We have two off-road parking spaces and unrestricted parking in the road. The family run Collington Lodge has six full en-suite bedrooms which are decorated to a very high standard. All rooms come with flat screen freeview television, hospitality tray, hairdryer and free Wi-Fi access. Follow A259 and turn off at Sutherland Avenue(B2098)heading towards town, turn left at Collington avenue and we are on the right hand side.